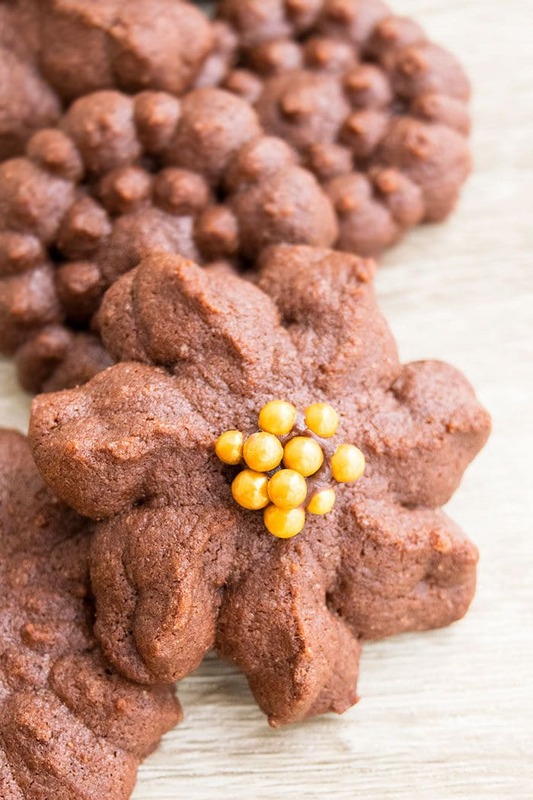 The best, vintage, classic, old fashioned, traditional, buttery, easy chocolate spritz cookies recipe, homemade from scratch with simple ingredients. These are popular Christmas cookies just like my Classic Spritz Cookies, which are piped into decorated designs with cookie press and dipped in melted chocolate and topped off with sprinkles. Great for holiday cookie exchanges. These are not your typical soft and chewy cookies. These are rich, buttery and crumbly and pair best with tea, coffee or a big glass of milk because some people find them to be a bit dry. What is a spritz cookie/ spritz butter cookies? The name spritz comes from a German word “spritzen,” which means “to squirt.” That’s because soft cookie dough is pushed through a cookie press to make beautiful designs. 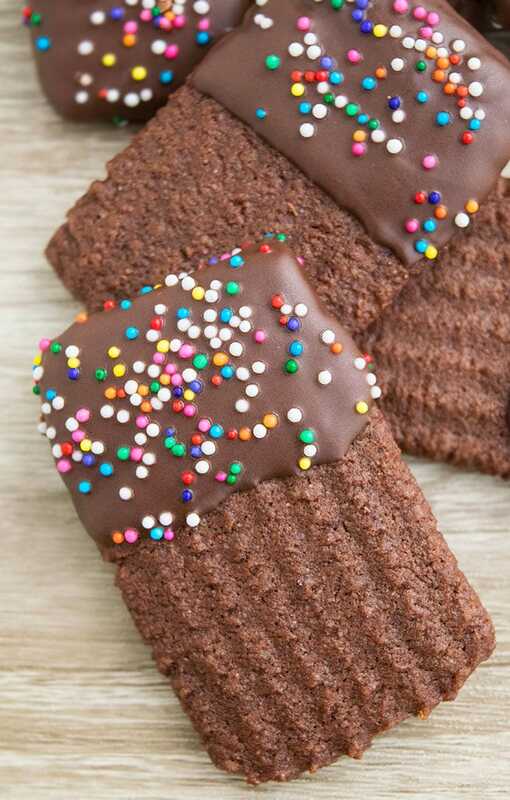 They are small cookies with a buttery, crispy and tender texture. 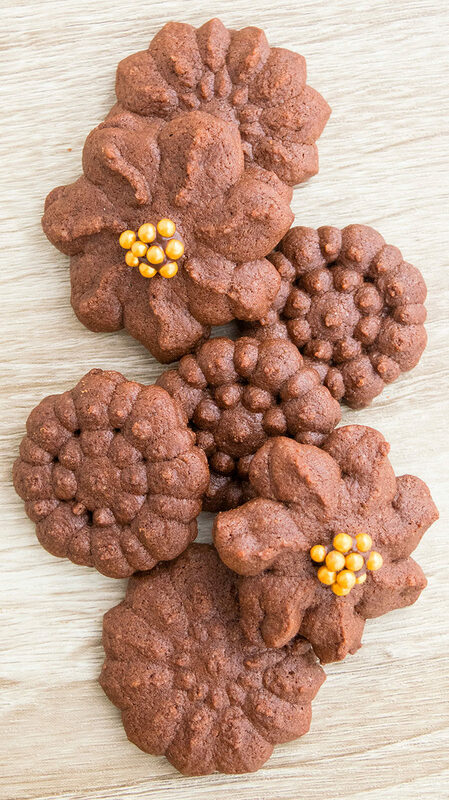 How to make chocolate spritz cookies? Mix in flour and cocoa powder. Load this dough in a cookie press and press cookies onto a baking tray. Yes! Once they cool down, don’t decorate them but put them in air-tight, sealed freezer bags and store in the freezer for up to 1 month. When you are ready to enjoy them, let them thaw on the countertop at room temperature. Why are my Spritz cookies flat? Why did they spread? Your cookie dough was too soft. Chill the dough for 30-40 minutes and then use it in the cookie press. I also HIGHLY recommend chilling the tray of piped cookies in the freezer for 10 minutes before baking, to prevent them from over-spreading during baking. There is something wrong with the ratio of your ingredients. You may have used too much butter. What is a cookie press? How to use cookie press? It is an inexpensive baking tool that consists of a barrel with a plunger on one end and decorative discs on the other end. The barrel is filled with raw cookie dough and then, you press the trigger/ plunger onto a baking tray until dough extrudes out through the patterned disc, yielding pretty cookie designs. Then, you bake and decorate the cookies. What can I use instead of a cookie press? Scoop small portions of the dough and roll them into small balls and flatten them with the palm of your hands. Place them on a cookie tray and bake. Fill a piping bag with cookie dough and attach a big star tip like Tip 1M and pipe the dough onto your cookie tray in round swirls like a rose. All ingredients should be at room temperature– Because they blend together smoothly and evenly. Use unsalted butter– Because this prevents the cookies from becoming too salty. Piping problems– If the cookie dough is not coming out of the cookie press properly, your dough is either too soft or or too firm and crumbly. If it’s too soft, chill dough in the fridge for 30- 40 minutes to make it easier to handle. If it’s too dry and crumbly, add a splash of milk or water to make it softer. The perfect dough texture should be soft so that it can move through the press smoothly. Chill the piped cookies– Because this prevents them from spreading too much while baking and they also hold their shape better. Decorate cookies- You can drizzle melted white chocolate or dip them in melted semisweet chocolate. You can also toss some sprinkles or chopped nuts. You can even decorate with Glace Icing or Royal Icing. I always decorate cookies after they have cooled down but you can decorate them before baking by tossing sprinkles or sanding sugar on each piece. Do no work in a hot kitchen! The heat makes the dough too soft and sticky and very difficult to work with. Do not remove cookies from tray until they cool down– That’s because the heat from the pan is still baking the cookies and removing them while they are hot will cause them to break. 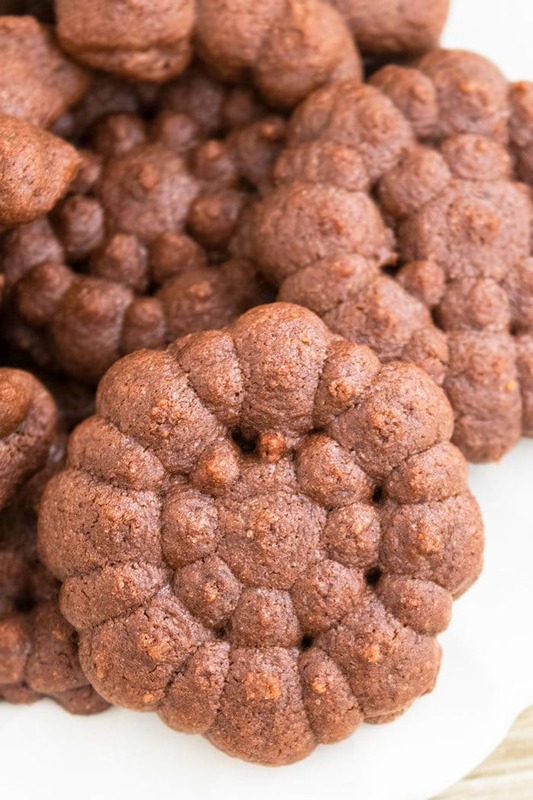 How to get chocolate Spritz cookies to stick to pan? I have never had this problem and always use cookie trays, lined with parchment paper but if you are having trouble, omit parchment paper and use a good quality cookie tray and squeeze dough onto it. There is enough butter in the cookies to prevent them from sticking to the pan during baking. Don’t over-mix dough– Because that yields tough cookies. 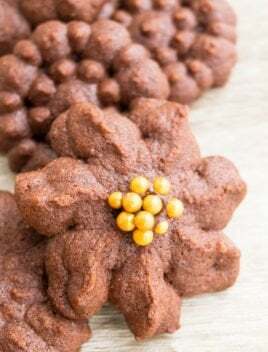 Classic, old fashioned, buttery, easy chocolate spritz cookies recipe, homemade from scratch with simple ingredients that are piped into decorated designs. Add egg and vanilla extract and mix until smooth. Add flour, cocoa powder and mix until just combined. Fill the cookie press with this dough and press cookies onto baking trays, lined with parchment paper. Tip: If dough is too soft, cover bowl and chill dough in fridge for 30-40 minutes to make it easier to handle. If dough is too crumbly and a splash of milk or water to make it softer. Chill trays in the freezer for 10 minutes. This is optional but really helps these cookies maintain their shape during baking. Bake at 350 degrees for 6-8 minutes or until cookies are firm along the edges. Allow them too cool down completely in the tray. Then, either dip half of each cookie in melted chocolate or pour some melted chocolate in the center of the cookies and stick some gold sprinkles. Place them on a sheet of wax paper and allow chocolate to set. Enjoy! Leftovers can be stored in a cookie jar at room temperature for up to 1 week.